How to Make a Butterfly Bead Wreath! While half of the summer is already behind us, there are still a lot of days left to keep your kids occupied before they go back to school. Between now and that bitter/sweet first day of the school year, we will continue to give you plenty of fun craft ideas for you and your family to enjoy! Butterflies are fascinating and beautiful creatures that have been around for at least 50 million years. Not only are they aesthetically pleasing to look at, but they are important to ecosystems and biodiversity! Butterfly-Conservation.org has a great list of plants you can add to your garden that will attract butterflies and help in the conservation of various butterfly species. Hanging this wreath near your garden or in your home can act as a great conversation starter! When someone compliments your wreath, that’s your cue to strike up a conversation about conservation! Begin by drawing a butterfly onto black felt or tracing a butterfly template (see Example I), folding the felt in half and cutting the shape out so you have two identical butterfly shapes. Do this for all of your butterflies. Making the butterflies in various sizes, shapes and colors will make your wreath more visually interesting than if they were all the same size, shape and color. While choosing to draw, rather than trace will take longer, it will benefit you in the long run! Cut 2, 10” pieces of thick aluminum wire and wrap them around each other in their centers, making an X. Wrap them around each other a couple of times to make sure they are secure. Glue the wire X in the center of a black felt butterfly. If the ends are too long, cut them. Then glue another black butterfly on top and seal the edges with glue. This will allow your butterflies to keep their shape. Fold your colored felts in half and cut teardrop shapes out in various sizes, shapes and colors. Folding the felt in half before cutting will provide you with two identical shapes that you can use to create the symmetrical markings on your butterflies! Once all of your colored teardrops are cut out, begin figuring out your placement on the black butterflies. When you have your butterfly figured out, glue the teardrop shapes to the black butterfly. Make as many butterflies as you’d like! Made them in black, pink, with beaded centers, with different colors- go wild and have fun! 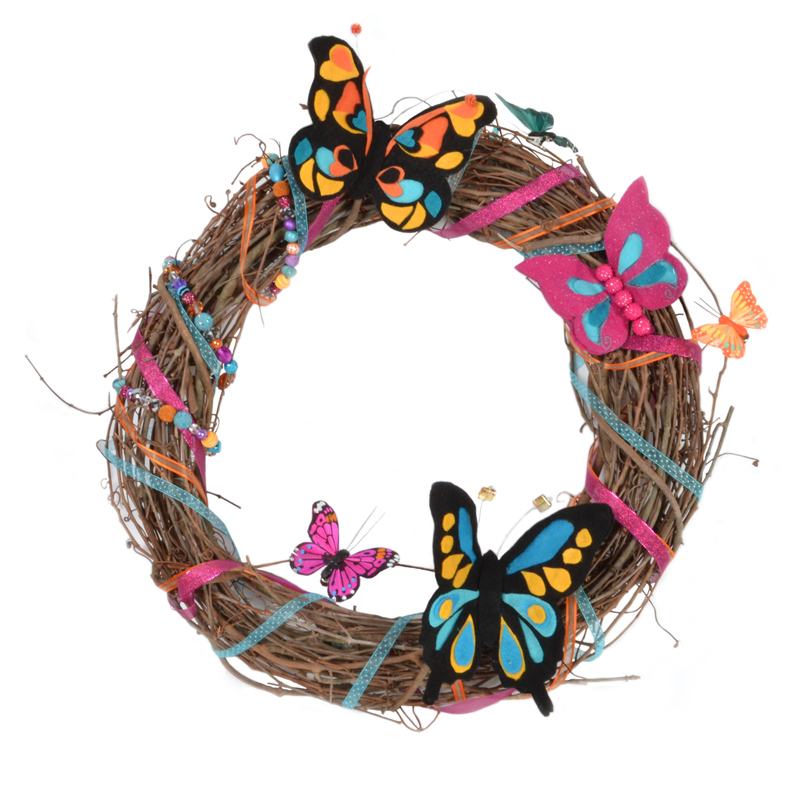 Lay out your butterflies on the wreath to see where you’d like to put them. Add your Nicole Crafts Butterflies, as well. Once you are happy with the placement of your butterflies, glue them to the wreath. With your various ribbons, begin wrapping them around the wreath as many or as few times as you’d like and glue the ribbon to the back of the wreath to secure it. Take your Jesse James Beads “Design Elements” packs and thread the beads onto your thin wire. Crimp the ends or bend the ends around to stop the beads from coming off the wire. Wrap the beaded wire around the wreath. Hang, enjoy, and start some conversations!